Introducing the new feature packed Toyota 8FB battery-electric forklift! With high energy efficiency, outstanding safety and driver comfort, it delivers excellent power and performance all with zero emissions. Plus the diverse range of options available gives you the flexibility to customise the 8FB to meet your exact needs. The feature packed Toyota 8FBN battery-electric forklift! With high energy efficiency, outstanding safety and driver comfort, it delivers excellent power and performance all with zero emissions. Plus the diverse range of options available gives you the flexibility to customise the 8FB to meet your exact needs. The 8FBN series features an Operator Presence Sensing system (OPS) that senses if the operator is not in the normal traveling position and interrupts travel power and load-handling operation. Toyota's optional exclusive System of Active Stability with proven features such as the active-mast function controller and active steering synchroniser optimises productivity, helping to provide for a safer work environment. The 8FBN series achieves longer operating time by minimising energy loss. An all-new pedal-stroke detection regenerative brake system allows the 8FBN to improve the efficiency of energy recovery thereby increasing operating times. Other features include - Anti-rollback, Slope Sensing Auto Power, Deluxe Multifunction Display (Includes: Load Weight Indicator, Digital Speed Meter, Power Select Function, Wheel Indicator, Travel Speed Settings and Over Speed Alarm). And best of all it's built Toyota tough, with reliability and durability that is second to none. The 8FBN Series is equipped with such features as a high-mount rear axle that positions the point of the rear axle support closer to the trucks center of gravity, that helps achieve stable turns. Other features such as an automatic turn-speed control combines lift-height and load-weight-sensing along with turn-speed control, automatically limiting the forklift's speed when turning and helping the forklift achieve more stable turns that match the operating conditions. The 8FBN also offers Regenerative Braking, Highly Efficient AC Motors, Drive System and Hydraulic System. 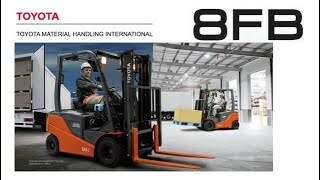 Easy entry and exit and a comfortable operating posture the operator friendly design of the 8FBN Series provides you with comfortable operation. The new 8FBN Series forklifts have a full array of customisable options available to meet your worksite needs. These include a height selector that simplifies load handling operation, a selection of operating levers, shock sensor to detect and warn collision impact, and a PIN code entry system to prevent forklift use by unauthorised personnel.